Is your child into Robotics? 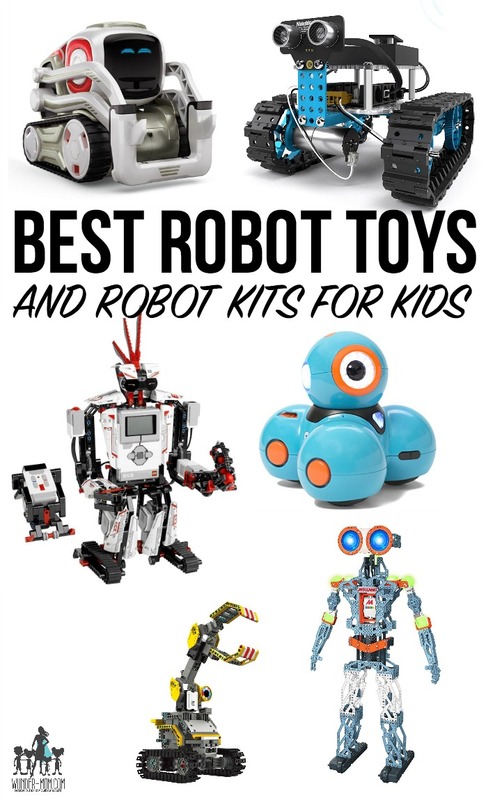 We have gone searching for the best Robot Toys or Robot Kits for Kids! My son has always had to loves when it comes to toys – electronics and building. It comes as no surprise then that he’s into robotics and looking for a robot kit for kids! Robot building can become quite pricy when you get into the adult programmable robot kits but thankfully we have found some of the best robot toys and robot kits for kids to fit all budgets and ages. STEM or Science, Technology, Engineering, and Math is being taught in schools at event he very youngest of ages. Using toys like LEGO to spark and interest. Once the children are old enough they begin learning about circuits and programming as early as the first grade! If you are looking for the best robot toys or a robot kit for kids I have several options to share – starting with the very basic is circuit building toys all the way up to the most extravagant fully built robots! As I was searching for the best robot toys for my son I found several toys and robot kits that would be great for beginners. Some of the robot kits are aimed towards children and other robot kits take much more knowledge and patience, possibly requiring an adults help. There are so many options for robot toys it can be a bit overwhelming – thankfully I have my 10 year old robotics fanatic to help me pick the very best robot toys! Top of the list for the best robot toys is Anki Cosmo. Cosmo has a beginner-friendly interface so that both kids and adults can learn to creatively code. The Remoking Robot Toy is an affordable option that still gives kids control. This robot toy can be both voice and touch commanded. Wonder workshop dash is a coding robot for ages 6+. Dash is voice activated, comes with 5 free apps, and can navigate objects. WowWee MiP Toy Robot is equipped with gesturesense which allows your robot toy to respond to gesture-based interactions like swipes, claps, and touch. The younger children can get in on the robot fun too with robot toys like Toysery Electronic Walking Dancing Robot Toy. The Click N’ Play robot toy is another option for younger children, this one controlled with a remote control. If your kids are looking for a Robot Toy that they can build themselves then you are going to want to look for a hands on robot kit for kids. A great beginner robot kit for kids is the LEGO Creator Robo Explorer. This simple robot kit is great for young beginners, has an excellent price point and is geared towards ages 7 and up. LEGO Mindstorms is a LEGO Robot Kit that has all the bells and whistles. This robot building kit is fun for all ages and comes with instructions for 17 different robotic designs. Builders can program their STEM robots to talk, walk, grab, shoot targets and more! The UBTECH Builderbots Kit is another great option to learn hands-on engineering by programming JIMU robots to navigate obstacles, pick-up objects, and more using Blockly code. For a little more challenge the Makeblock starter robot kit is a 2 in 1 advanced mechanical building block for kids aged 10+ to learn to robotics, electronics, and programming. My personal favorite is the Meccano Meccanoid, a 4 ft. tall robot to build, program and play with! If your child is not quite ready for robot building kits but are still wanting to learn the basics of robotics you can start them out with circuit building toys. Snap Circuits and Snap Circuits Jr. are the prime learning toy for circuit building. With snap circuits you can build working models of a burglar alarm, a radio, and much, much more. OSOYOO Basic Starter kit is the next step up in circuit building kits for kids. With this kit you can learn the basic concepts of buttons, resistors, sensors, IR remote control and receivers, how to use sensors to detect environment(i.e. light, temperature), and how to use 74HC595 Shifting Register IC to extend Arduino Digital Ports. This kit is meant specifically for those interested in using Arduino. The EUDAX School Physics Lab has a great kit to learn basic Electricity and Magnetism experiments through full-color manuals to understand the basic principles.